We are pleased to announce that The Reader Organisation won the Growth award at the Social Enterprise Network Powerful Together Awards last night, recognising our consistent growth, entrepreneurialism and resilience. Social Enterprise Network is the home of social enterprise in Greater Merseyside. Its annual Powerful Together Awards celebrate the brightest and best local businesses and community organisations that are committed to social value. We were also runner-up for the Creativity and Healthy Environments awards, which deservedly went to Big Heritage and Heart of Mersey. The Reader has a strong track record of making ideas happen and creating social impact. Since 2008, we have doubled our income, increased staff numbers by 200%, and increased our shared reading activity by nearly 300%. The development of projects and teams across the UK mean that Get Into Reading is now reaching more communities than ever before and we currently have sister projects developing in Belgium, Denmark, Northern Ireland and Australia. One of our most exciting new projects is the development of Calderstones Mansion House into the International Centre for Reading and Wellbeing. This will not only strengthen our position in the North West as a leading facilitator of social change; it will also enable us to uphold this foundation in places across the UK and beyond. We thank Social Enterprise Network for allowing us to be part of such a great night, and for their hard work in recognising and celebrating new and existing social enterprises on Merseyside. We didn’t win, but we did have a dance! Last Thursday, in the lovely surroundings of The Isla Gladstone Conservatory The Reader Organisation’s Mersyside Community Theatre project, was in the running for the Liverpool Mutual Homes (LMH) Unity Award for a Community Organisation. 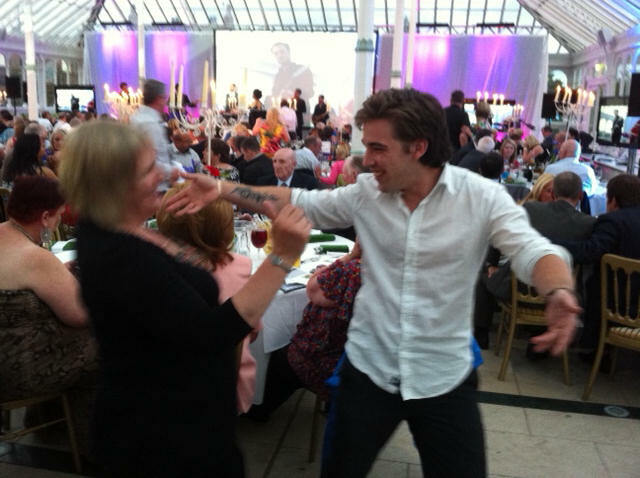 It is with great regret that I inform you that sadly we did not win… however, as you can see in this picture, we did have a dance! Congratulations to The Princes Trust who won in our category, and to all the other award winners and runners up. Author niallgibneyPosted on 5th July 2011 17th February 2017 Categories Awards, News, The Reader, TheatreTags Merseyside Community Theatre2 Comments on We didn’t win, but we did have a dance! Shakespeare’s Othello will take to the stage at Sheffield’s Crucible in September. Directed by Daniel Evan, this major revival includes The Wire stars Clarke Peters (Lester Freamon) as Othello and Sheffield-born Dominic West (Jimmy McNulty) as Iago. 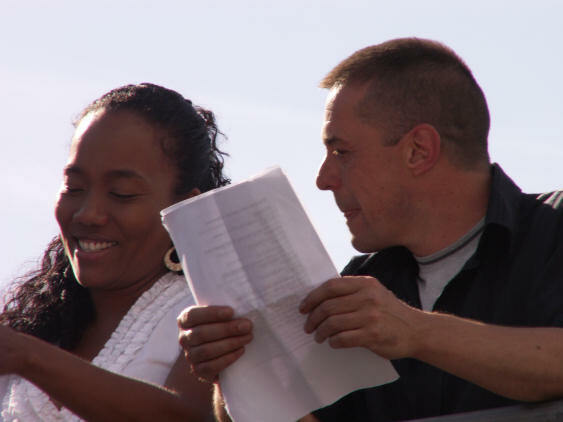 Cast your minds back 11 and a half months and you might remember that Sonja Sohn (The Wire‘s Kima Greggs), paid us a visit to read the balcony scene from Romeo and Juliet, as part of our Merseyside Community Theatre project. You can see her in action on Channel Four News by clicking here. 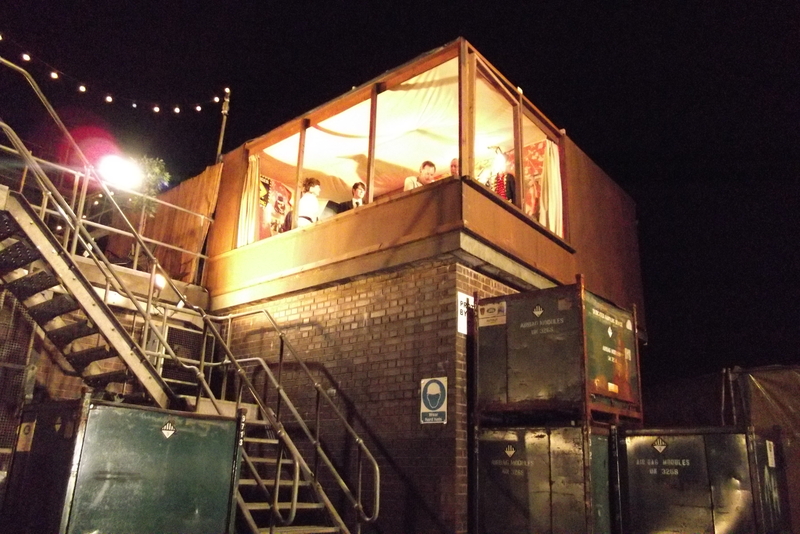 Did you miss Romeo and Juliet at the Fire Station? Want to relive some of the memories? No idea what I’m talking about?! One of my friends has seen ‘Romeo and Juliet’ on five other occasions and she mentioned that this was the best version she had ever seen. Thanks to The Reader Organisation also for having the guts to bring this to my community – not many would have given us the chance to shine – now, for the first time in a long time, good things are being reported about the area and everyone is buzzing. A great positivity seems to be in the air. I had low confidence before this project and was very shy meeting people, but now I’ve made some great friends, become more sociable, and have more confidence within myself. My eyes have been opened to the possibilities in life and I feel I can deal with anything. I wasn’t too sure what to make of it at first, nothing like this had happened in Croxteth before, but when I saw how many people came to watch and just how good it was. I thought it was fantastic, for all the people involved and for the image of the area. Well done, more please. Four performances, three long days of technical and dress rehearsals, three weeks of hard rehearsals, two weeks of auditions, five months of outreach and advertising, and many difficult decisions later, we had Romeo and Juliet at the Fire Station. 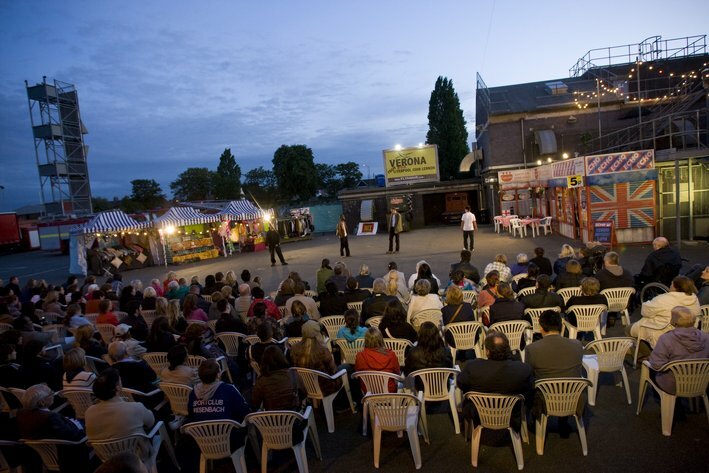 The Merseyside Community Theatre production ran from Thursday 26th to Saturday 28th August 2010 and was enjoyed by hundreds of people at each show. Set designer Olivia du Monceau makes inventive use of the site, turning outbuildings into the Capulet Cavern and cafe, a curtain-sided lorry into Friar Laurence’s (Caoim Eaves) cell, and a hanger into a party venue where the young cast put on an entertaining rendition of Michael Jackson’s ‘Thriller’ routine as Romeo meets Juliet over the fruit punch. Through the dedication of the production crew and the time the cast has given up in order to take part, we have created something we can be very proud of. There are so many great memories I will take away from this project, and many many more to come flooding back once we start releasing photographs and video. Talking of photographs and video… we have a lot! There are hundreds of photographs we will be releasing over the coming days and weeks on our media pages, and to follow, the complete play on DVD from The Reader Organisation. Thank you to all involved in making this project happen, and to our cast and crew as without their performances and knowledge, none of this would have taken place. 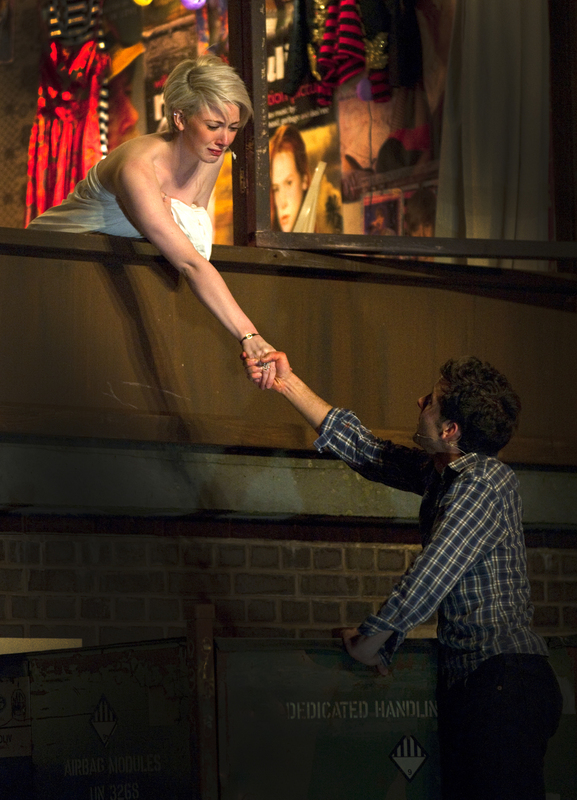 "O think'st thou we shall ever meet again?" It’s the morning after the opening night of Romeo and Juliet at the Fire Station, and the cast and crew are revelling in what was a truly spectacular – and very professional – performance of Shakespeare’s greatest love story, brought up to date and back to life by thirty-one Liverpudlian cast members. 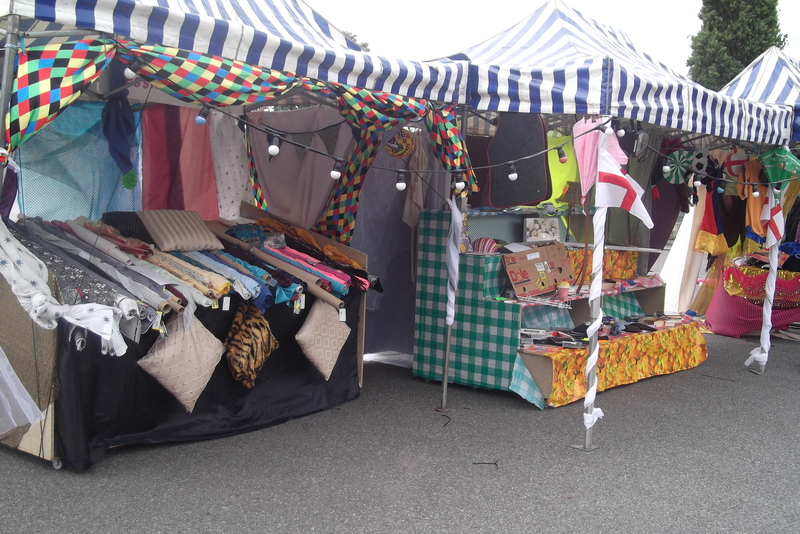 The remarkable transformation of Croxteth Fire Station into ‘fair Verona’ – market stalls littered with fairy lights and scary costumes (I won’t spoil the surprise for those yet to see it and say why!) – greeted the audience on arrival. After a very slight delay (what opening night goes without its minor technical hitches?) 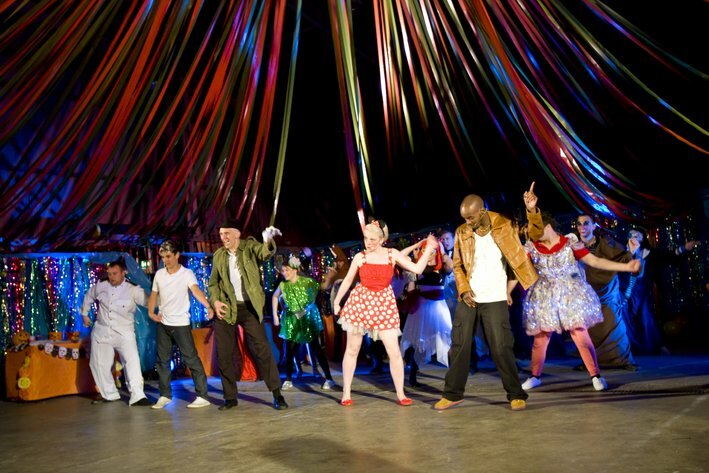 everyone found their seats and the show began in a flurry of activity which introduced them to Romeo (Danyel Roberts), Juliet (Helen Webster), and all of the other characters who were to entertain them for the next two hours. 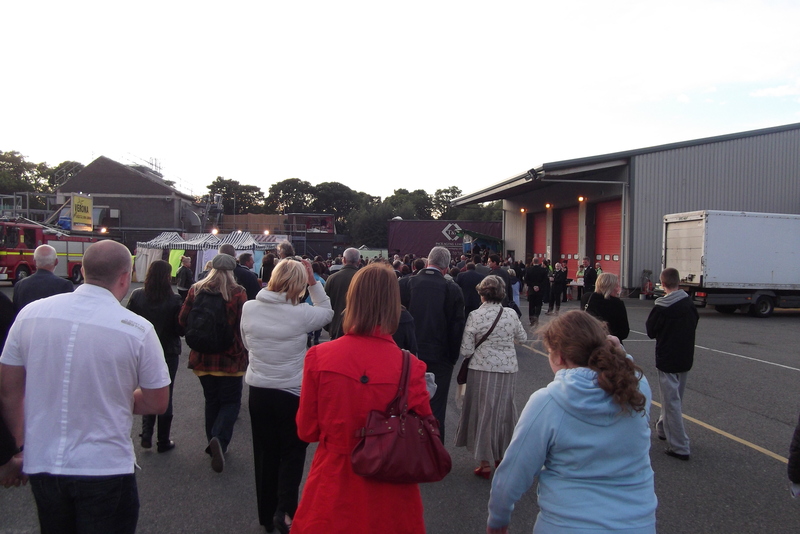 Romeo and Juliet at the Fire Station is a promenade performance, so as well as being outdoors the audience were asked to follow the action as it moved around the set: from the market scene, to ‘Capulet’s Cappucinos’ coffee shop, Juliet’s bedroom and Friar Lawrence’s cell. Each (OK, well, most) of the movements were smooth and efficient, and with characters running through the audience at points it certainly felt like everyone watching was part of the action. Though the entire cast put on a great show the highlights have got to be Mico Simonde and Philip McGuiness, who stole the show with their portrayal of Benvolio and Mercutio – although the decision to involve a couple of Fire Engines (again, no clues as to why!) in the action was another show-stopper, adding to the fantastic atmosphere that came from watching a production take place on a working Fire Station. All in all it was a funny, moving, and generally outstanding performance, of which all involved should be justifiably proud. 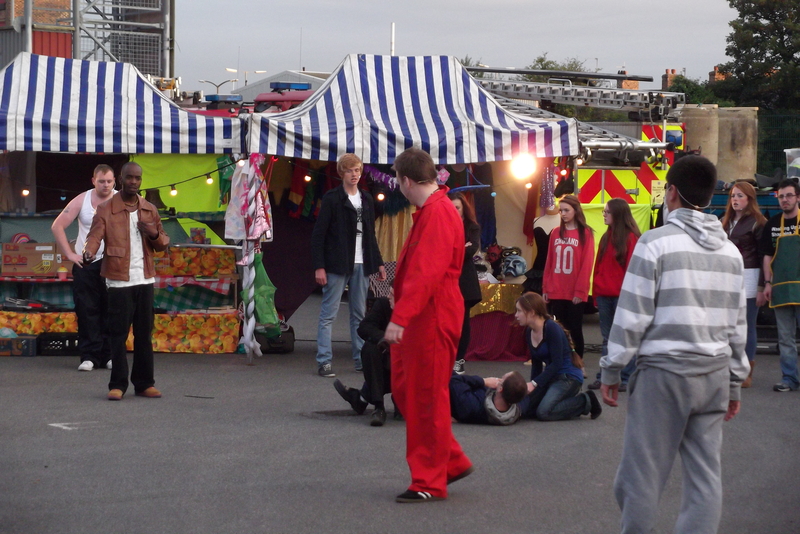 Romeo and Juliet at the Fire Station will be performed tonight at 7.30pm, and tomorrow (Saturday 28th) at 2.30pm and 7.30pm. Author ClairePosted on 27th August 2010 Categories Reviews, TheatreTags Merseyside Community TheatreLeave a comment on Opening Night Success! All this talk for months and now, the day is finally here, the first of Merseyside Community Theatre’s shows of Romeo and Juliet at Croxteth Fire Station. I’ve been up there this morning and the station has been utterly transformed – there are a lot of rather bemused looking firefighters walking around the place. 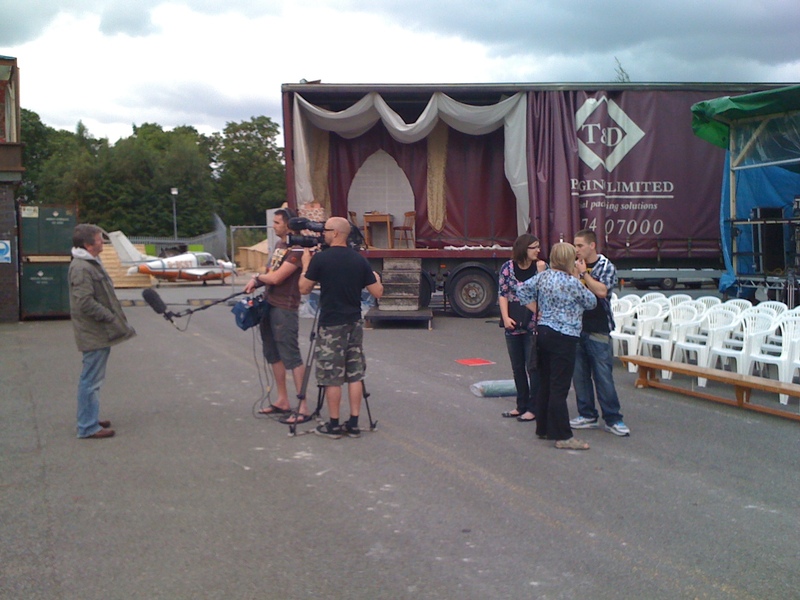 This morning we’ve had film crews and photographers up there interviewing the cast and crew, people from TRO and the fire service, the setting, the rehearsals – it’s getting a lot of attention. It’s all sold out for tonight but there are still tickets available for tomorrow and Friday – just come along, or visit the MCT site to find out how to book. Due to the large number of bookings that have been made for Romeo and Juliet at the Fire Station, we will no longer be taking reservations for tomorrow night’s (Thursday 26th) opening performance. You are still very welcome to come along to Croxteth Fire Station (Storrington Ave, L11 9AP) from 7pm to see if there are any tickets available on the door (unfortunately, availability cannot be guaranteed). After months of preparation, weeks of rehearsals, and days of panicking the opening night of Merseyside Community Theatre’s production of Romeo and Juliet at the Fire Station will soon be upon us! 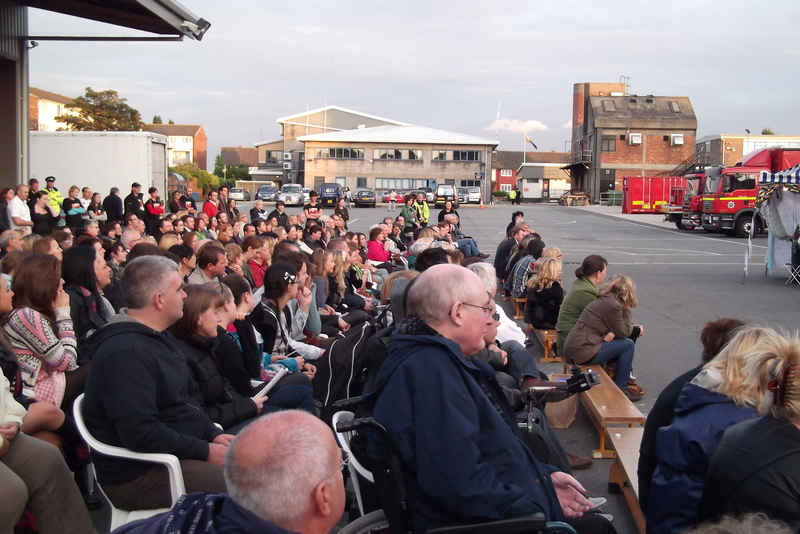 This Thursday 26th August at 7.30pm, around 300 people will walk into Croxteth Fire Station to watch the community-led production of the greatest love story ever told, directed by Neil Caple (RSC, Brookside). Catch the Bard in Croxteth while you can! The programme featured interviews with translator Martin Orwin, who outlined the remarkable tradition of poetry in Somali, and with PTC Director, Sarah Maguire, who discussed the importance of translating Somali poetry into English. Poet W N Herbert, who co-translated Maxamed Xaashi Dhamac ‘Gaarriye’ with Martin Orwin for the PTC, talked about the complexities and delights of the translation process, and the impact it’s had on his own writing.